Civil Rights Activist Argues To Keep Confederate Monuments Andrew Young, former mayor of Atlanta and African-American civil rights activist, says the fight to remove monuments memorializing the Confederacy alienates potential civil rights allies. Andrew Young, former congressional lawmaker, U.N. ambassador and Atlanta mayor, in 2011. In cities across the U.S., calls to take down monuments to Confederate leaders are growing louder since the deadly events in Charlottesville, Va.
One of the most dramatic monuments to the Confederacy is called Stone Mountain, in northern Georgia. It's sort of a Confederate Mount Rushmore, with Stonewall Jackson, Robert E. Lee and Jefferson Davis carved into a mountainside. 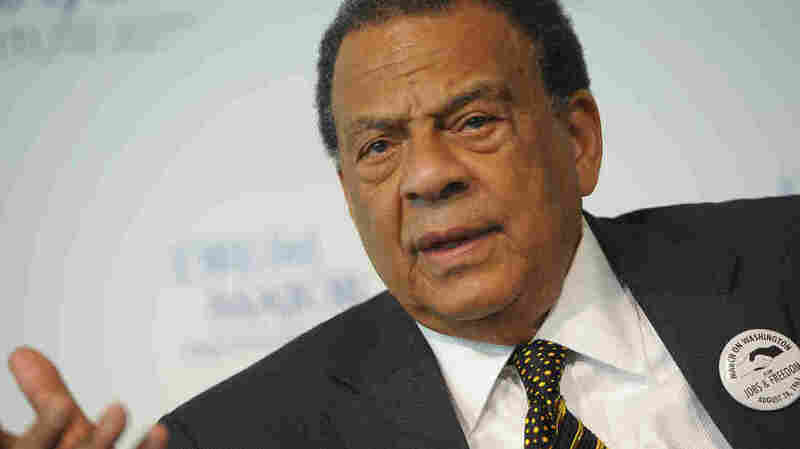 Andrew Young, a former mayor of Atlanta and lifelong African-American civil rights activist, says the memorial should stay. Young served as a congressman from Georgia and ambassador to the United Nations. He was with Martin Luther King Jr. the day he was assassinated. "That is a tremendous carving. And I don't want to see that destroyed. I don't care who it is," he says. 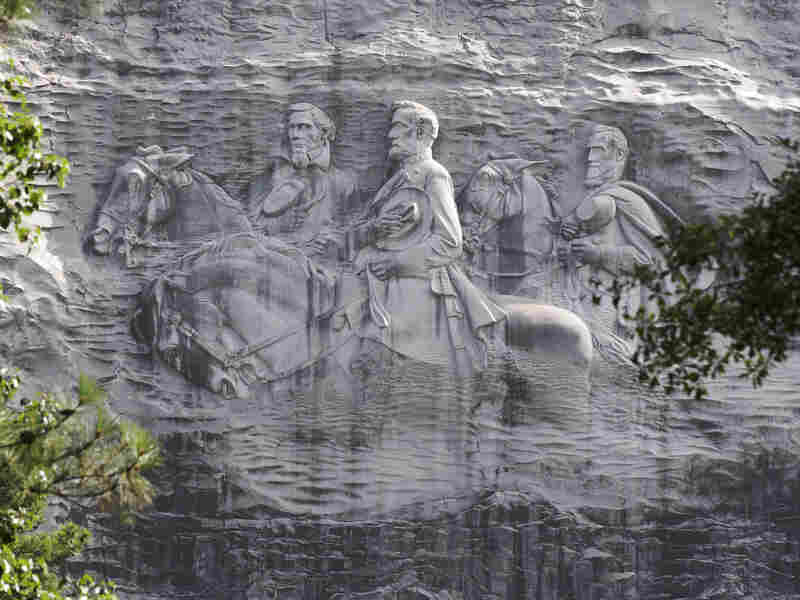 On Stone Mountain near Atlanta, a carving depicts Civil War Confederate figures Stonewall Jackson, Robert E. Lee and Jefferson Davis. Young is not alone. An NPR/PBS NewsHour poll released this month found that 44 percent of African-Americans believe Confederate memorials should stay, compared with 40 percent who say they should be removed. Nationwide, 6 in 10 Americans say the monuments should remain. Still, Young's comments come as prominent Democratic and African-American activists call for the monuments to be removed or "contextualized," to avoid celebrating the leaders who supported slavery. We made progress in the civil rights movement as 12, 13 percent of the population at most. We couldn't have made any change with that. In order to make change we had to build a majority of at least 60 percent. We could build a majority around lunch counters. We could build a majority around jobs. I'm saying these are kids who grew up free, and they don't realize what still enslaves them — and it's not those monuments. What worries me is that this country will turn to the right so that it'll — be taking down Martin Luther King's statue next when the racist majority takes over. And I'm saying that a minority can't be provoking a racist majority that is still underemployed, undereducated and dying faster than we are — that the issue is life and death – not some stupid monument. I would only consider adding to it a freedom bell because Martin Luther King said in his speech, "Let freedom ring from Stone Mountain [of] Georgia." He named that specifically. Morning Edition editor Daniella Cheslow and Web producer Heidi Glenn contributed to this story.